Marilyn is the star at the bordello called The Divas. Juan Ignacio is close to marrying Lorenza; during his bachelor party the meets Marilynr and they fall in love. This was the best soap opera I have ever seen, I started viewing it a few weeks after it had started and since I was hooked. Romantic, yet funny... it had lots of learning lessons, I recorded about 80 percent of the soap and watch it on rainy days....! It's based on Marylin (scarlet) who was a prostitute from an early age, brought in to that cycle by her mom, who was always interested in money. 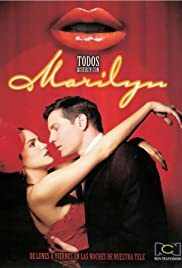 Marylin works in this prostitute house, and has some very good friend along with plenty of enemies, that is because every men that meets her wants her, giving the soap it's title. She meets her blue prince and since meeting him, isn't able to do her job any more, like every other soap their romance is interrupted by everyone and their mother... But I wont ruin it for you, cant wait to see if they put this out on DVD.